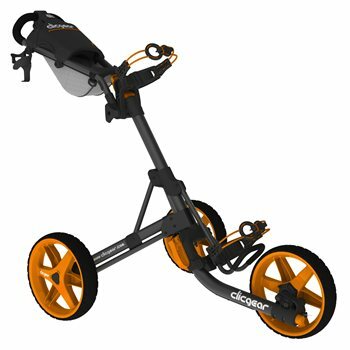 The Clicgear Model 3.5+ cart features an easier-to-open design along with maintenance-free airless tires, an umbrella tube storage bracket, and an improved Positive-Lock hand brake system. It also features a full-size console, a handle adjustment knob, powder coated finish to resist scratching, removable beverage holder, and an alignment adjustment system. The Model 3.5+ retracts down to 24" x 15" x 13" size for easy, compact storage. Improved Brake System will reduce the small number of brake failures while also improve engaging the brake. New enlarged cup holder will accommodate oversized water bottles and Silo style cups. New Umbrella Storage bracket will hold umbrella holder tighter in place, while also accommodating the Umbrella Angle Adjuster. New bag straps will be easier to grab while also being visually nicer than the existing straps.